I watched part of #Girlboss on Netflix so you wouldn’t have to. Yes, that does make me a martyr to the cause. This thirteen episode series on Netflix is more about the vintage clothing industry than it is about old clothes. In particular, it addresses the big changes that occurred in the vintage market starting around 2005. It is the story of one vintage seller, Sophia Amoruso, the founder of Nasty Gal Vintage, who turned her ebay store into a major e-commerce site selling trendy new ready-to-wear. The story is a mix of fiction and the truth as Amoruso wrote it in her 2015 book, #Girlboss. I have not read #Girlboss, and I only started watching the series after reading a discussion of the series in a facebook group of vintage clothing sellers. It seemed as if Amoruso was telling her version of why she got kicked off ebay in 2007, and it did not jibe with my own remembrance of the events. This is not the first bad review #Girlboss has received. Many of them focus on the main character, a fictionalized version of Amoruso, and her complete depiction as a “garbage person”. She steals, she lies, she takes advantage of her few friends. She has no redeeming qualities at all. But in spite of her complete lack of character, I found myself not even caring. Is it because we as a society have become so used to narcissistic, despicable people who are only interested in what benefits them? Something to think about. So I found myself skipping several episodes. I was, after all, only in it for the vintage. So Sophia floundered around, looking for direction when she sold a few things on ebay. She quickly realized there was a buck or two to be made, so she started studying the sellers who were the most successful. This came at a time when eBay was changing rapidly. I first started using eBay to buy vintage around 1998. For several years I could come home from work, sit with a cup of coffee, and go through all the new vintage clothing listings in about thirty minutes. By 2006, when this story starts, that was no longer possible. The category had grown, sub-categories were put in place, and eBay started community chat boards, including one for vintage clothing. Until around 2005, most vintage sellers were were experienced dealers who had been in the business for years. Many owned brick and mortar stores. Prices were good for both buyer and seller. And most buyers seem to have been interested just in the wearing or collecting of vintage clothing. Then, some very smart young women realized that by selling old clothes as fashion, they could make a lot of money. Styling and tall, thin models replaced hanging mannequins and clothes spread out on the floor for photos. Overnight the game had totally changed. Sophia found she was very good at this game, which often involved taking thrift store finds, many of them from the late 1970s and the 1980s, and cutting them up to make them more in tune with the styles of 2006. By this time, the cutting up of old clothing had come to the attention of other sellers, and it was being discussed freely on the Ebay Vintage Clothing discussion board. Most of the comments were critical, though there were defenders of the practice. I was of the opinion, which I stated several times on the board, that cutting up 1970s JC Penney polyester dresses designed for someone’s grandma was not a big deal, but that from what I could tell, some of the scissors-happy sellers seemed to have no experience with clothing, and so the possibility of valuable or historically important pieces getting ruined was high. Amazingly, there is quite a bit in #Girlboss about this criticism. In one episode, another seller, one of the “protectors of vintage” traveled to Sophia’s apartment to shame her for the practice of destroying old clothes. By the end of the episode, Sophia and the other seller seemed to have bonded, and the other woman gives Sophia a treasured dress,which turns up on Nasty Gal Vintage, chopped up beyond recognition. I’m pretty sure that never happened, and was just written for the Netflix series. I think this episode is a metaphor for the online criticism Sophia was getting for her slash and trash selling tactics. But it does continue with the on-going “feud” between Sophia and her eBay haters. 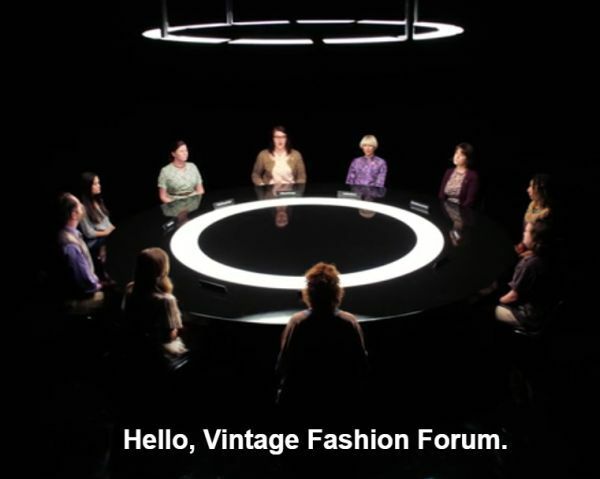 Probably the most imaginative thing in the entire series is the episode shown above, showing the Vintage Fashion Forum as people in a dark space, talking around a circle as though they were speaking through their computers, bashing NastyGal for cutting up the vintage. Occasionally NastyGal shows up, along with her friend, who is acting as a white knight. The portrayal of the other vintage sellers is pretty funny, and I’m thinking that is probably how the young and smug Sophia really viewed the people on the forum. Or rather, how she wanted them to be. All are seriously up-tight, dowdy, and socially inept. But they get their revenge by getting Sophia kicked off eBay for having external links to her MySpace (2006!) page in her item listings. From what I’ve read, this is also what Amoruso tells in her book, but although this was against the rules, I really do not think it was enough to get a person kicked off the site, especially one who was making so much money for eBay. The was another, and much more serious discussion about NastyGal and some of the other newer sellers – that of shill bidding. Before Ebay tightened up its rules and procedures, one could have any number of bidding ids. And bids were shown by bidder on the sales page. Some people on the Ebay Vintage board were actively following all the auctions of those suspected of bidding on their own auctions. I do not have personal knowledge of why she was kicked off, but there were lots of complaints, and people were investigating the alleged shilling and reporting it to ebay. But while she bragged about the petty shoplifting in her book and in the program, shilling is a serious matter, which may be why she glossed over that part of the story. She did deny that she ever shilled on eBay in a 2014 interview. Something that always strikes me as ironic about fashion movies is that we are always advised that fashion is art, while at the same time we are reminded that fashion is commerce. Not that the two cannot peacefully co-exist, as we are also told in The First Monday in May. That’s just the first of many fashion truisms that the viewer is exposed to in this 2016 documentary on the annual Met Gala which is a fund-raiser for the Costume Institute. I had not been anxious to watch this one, as my interest in galas and celebrities is so low, but throw in the Costume Institute and the availability of the film on Netflix and I decided it was worth a try. As it turns out, I’ve watched it twice, not because it is so good, but because of what it reveals about the relationship between Vogue and Vogue editor Anna Wintour, and the Costume Institute and curator Andrew Bolton. First of all, I’m glad that Wintour has been so effective at raising money for the Costume Institute. In 2015 alone, $12.5 million was raised. It’s obvious that she is an excellent manager, and her brusqueness seems to me to be a characteristic of a person who just wants to get things done. In the film there was a not so sly segue from Anna May Wong as the Dragon Lady, to Wintour. Can’t we just get past the fact that here is a woman who has a lot to do and who can’t spend her time pussyfooting around feelings? Apparently not, and it seems a bit odd seeing how The First Monday in May was co-produced by the director of special events at Vogue, Sylvana Ward Durrett. It seems very unlikely that a woman who worked so closely with Wintour would portray her in any light other than the one Wintour wanted. In fact, knowing of Durrett’s involvement in the film puts a whole other light on it. She also is a major player in the movie, as the planner of the gala. But what I found to be most interesting was how much input Wintour had on the exhibition itself. In the photo above, (taken from the press kit on The First Monday in May website) you see Wintour looking over the projected exhibition. Months before the opening, Bolton is seen showing Wintour a montage of photos of the clothing that was to be included in the show. She is shown giving approval (or not) at every step of the process. I’ve always suspected that Wintour has a lot of influence in the Costume Institute shows. It’s always been a bit puzzling as why, when the Institute has one of the best collections of historical clothing in the world, that so many of the more recent shows rely on clothing from the 21st century, much of which is borrowed from the design houses. Putting so much focus on recent clothing would certainly help boost the current fashion industry, something that is also the mission of Vogue. The exhibition in 2015 was China Through the Looking Glass, about how designers have used the historical view of China as an influence. Heavily represented were Alexander McQueen, John Galliano for Dior, Karl Lagerfeld for Chanel, and John Paul Gaultier. Less represented were historical artifacts from the Met’s own collection, though I did see a 1920s Lanvin and a group of Poiret dresses, a 1920s embroidered shawl, and two dresses from the 1950s. I’m sure there were more (I did not see this show in person) but considering there were around 150 garments in the show, the few I spotted are definitely in the minority. It just seems like so much of the permanent holdings of the Costume Institute never sees the light of day. Considering how Chinese culture has been an influence on Western fashion for centuries, I feel quite certain in saying that this exhibition could have pulled almost entirely from the Met’s own collection. But then without all the current designer’s work being represented in the exhibition, how could one get them to the gala, and especially how could they get them to pay for one of the sponsor tables? It all seems so cozy, with the designers and their muses touring the exhibition, looking for their own work. While so much of the movie is about the planning of the gala, quite a bit of time is also devoted to Andrew Bolton and his process of working through the plan of the exhibition. This might have been interesting if not for the constant hand wringing over whether “others” at the museum considered fashion to be art. By others, I guessing Bolton was primarily referring to the curator of East Asian art, who was supposedly in a collaboration with the Costume Institute for this exhibition. This curator repeatedly voiced his concerns about how the objects in his department were going to be used, and each conversation seemingly ended with Bolton yet again whining about how fashion was so misunderstood in the Met. It occurred to me that it might not be a good idea to go on so on camera about colleagues not respecting you, especially with words like, “Some people have a very 19th century idea of what art is.” And even at the very end, when the installation was complete and was looking over the top marvelous, the Asian art curator congratulated Bolton, but Andrew very ungraciously dismissed the other curator and turned to his partner for a hug. Frankly, I’m sick to death of the “Is fashion art?” question. As long as people are lining the halls of the museum to see fashion, who cares. I could actually go on longer with this, as I’ve not even touched on how questions of appropriation and culture were handled, but I’m over my word limit. 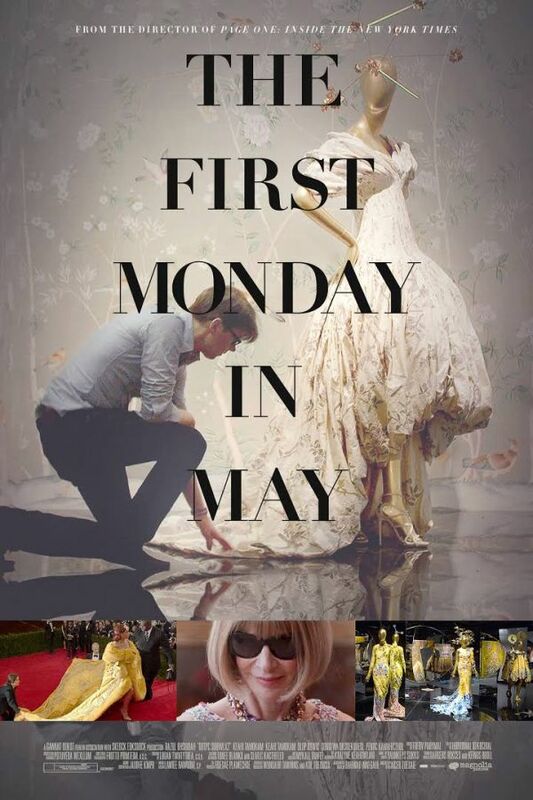 I suggest you watch The First Monday in May, not as a lover of fashion history, but with the goal of looking for the great bits. I loved seeing inside the fashion conservation department. There is an interesting interview with John Galliano. But best of all is when the late Bill Cunningham congratulates Bolton, but makes the faux pas of bringing up the ghost of Diana Vreeland. You just can’t make this stuff up. Dior and I was a documentary film released earlier this year, but which followed the first two months of designer Raf Simons’ tenure as artistic director at the House of Dior in 2012. This was after the embarrassing dismissal of John Galliano for conduct unbecoming a couturier the previous year, and the fashion world was anxious to see if Simons could restore order to the prestigious house. Simons was an interesting choice to head Dior. He is Belgian, and barely spoke French, at the time at least. He had been designer at Jil Sander, a company that was about as far in the other direction from the extravagant designs of Galliano as one could get. He had never worked in couture, and at the time he was hired there were only eight weeks before the next couture show. Intertwined with the story of how Simons worked at Dior was the ghost of Christian Dior, the man. The film used quite a bit of archival material to show the heritage that Simons was expected to draw from in his work for the company. And the words of Christian Dior, drawn from his 1957 book, Christian Dior and I, added depth to the story. I especially liked the scenes that showed Simons and assistants studying old sketchbooks and materials from when Dior was actually headed by Christian Dior. It is interesting how the book came into play in the film, and especially since Simons announced that he had tried to read the book but gave it up after fifteen pages. He found the approach that Christian Dior had used, in talking about himself and the firm Christian Dior as two separate entities, to be odd. Some critics dismissed Dior and I as just a ninety minute commercial for Dior, and it does paint a very pretty picture. It also gives a very good look into the workings of a couture house. Most interesting is how Simons worked as creative director, as the modern designer really is more of a director than he is a hands-on designer. It became obvious very quickly that Simons was responsible for a lot more than just designing pretty dresses. Much has been written lately about the extreme stresses put upon the creative directors of major design firms, and from watching Dior and I one does get a sample of how demanding the job is. The point is made more significant due to the recent resignation of Simons from Dior. Among the reasons he gave for leaving his position was that he needed more balance in his life. There really is more to life than work, evidently. Dior and I is currently available on Netflix. 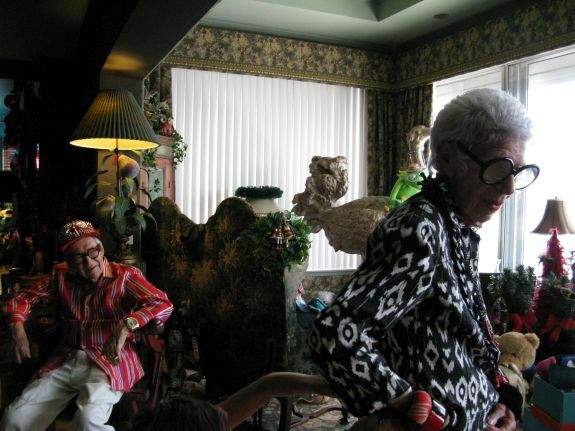 Carl and Iris Apfel in IRIS, a Magnolia Pictures release. Photo courtesy of Magnolia Pictures. Iris, a film about Iris Apfel by Albert Mayeles, was recently added to Netflix, so of course I added it to my viewing queue. I really wasn’t too anxious to see it, as I’d lumped her into the category along with other eccentric dressers who have attracted the attention of photographer Ari Seth Cohen of Advanced Style. I was not prepared to find that Iris is the real deal, a woman who dresses to please herself, and not to be featured on a blog. And while she is known for her extravagant outfits, and especially her vast jewelry collection, Iris is surprisingly down-to-earth. She dresses in what she likes, whether that be a shirt embroidered with the figure of Mickey Mouse, or a designer item from Bergdorf Goodman. The overwhelming lesson from Iris is that one needs to be true to his or her self. Iris has a lot of clothes. There are racks and boxes all over her apartment, and she kept her mother’s apartment because she needed the storage space. We see her on several shopping treasure hunts, but the film also shows her in a meeting in one of her clothing storage areas, going through boxes she is donating to the Peabody Essex Museum. Iris formed a relationship with the Peabody Essex after a show featuring her wardrobe traveled there. She decided to will her collection to the museum, but she has already gone ahead and started the process of handing over many of her treasures. The Peabody Essex might seem like an odd choice to receive Iris’s collection, especially since it was the Metropolitan’s Costume Institute that originally developed the exhibition of her clothes. The movie explains that Iris realized that her wardrobe would fill in a big gap in the costume collection of the Peabody Essex, so she saw the opportunity to make a difference at that museum. I think she did a wise thing by choosing a smaller museum. At the Met her stuff would have been swallowed up in their vast holdings. Iris is full of her wisdom, and she has some real insights into aging and how to handle it. Seriously, you don’t have to love fashion to love this film. 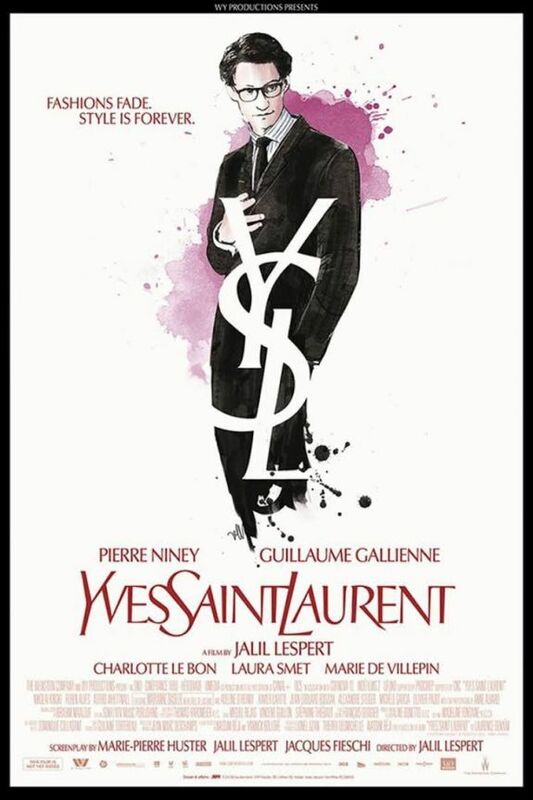 Last year two competing movies about the life of designer Yves Saint Laurent were released. One of them, Yves Saint Laurent was recently added to Netflix, and so I finally got to see it. To be honest, I was not all that eager to see the film, as YSL – the man, not the designer – seriously depresses me. After sitting through a documentary that was filmed before his death, I’d vowed to never sit through two hours of Yves ever again. But I broke my promise,and I’ve got to say that this movie was a very mixed bag. First, I’ll give you the good news. Because Pierre Bergé, Saint Laurent’s longtime lover and business partner, and the president of the Pierre Bergé-Yves Saint Laurent Foundation, was involved with this film, the makers had access to the YSL archive, including the actual clothing. Much of what is shown in the fashion show sequences is thus the real deal, and it shows. Unfortunately, there was just not much that could be done to make Saint Laurent a more sympathetic or likable character. Not that he is shown as unlikable, it is just that all the drugs and poor choices combined with the poor, fragile persona that he projected make the depiction of him hard to watch. It helps to know a bit about Saint Laurent’s life, as the movie is fast-paced, and it is in French with sub-titles. It seemed to me that it would have been hard to follow had I not already known much of the story. So, would I recommend Yves Saint Laurent? Yes, but only for the look at those fabulous clothes in action. Otherwise, unless you love watching a talented and creative man self-destruct, give it a pass. 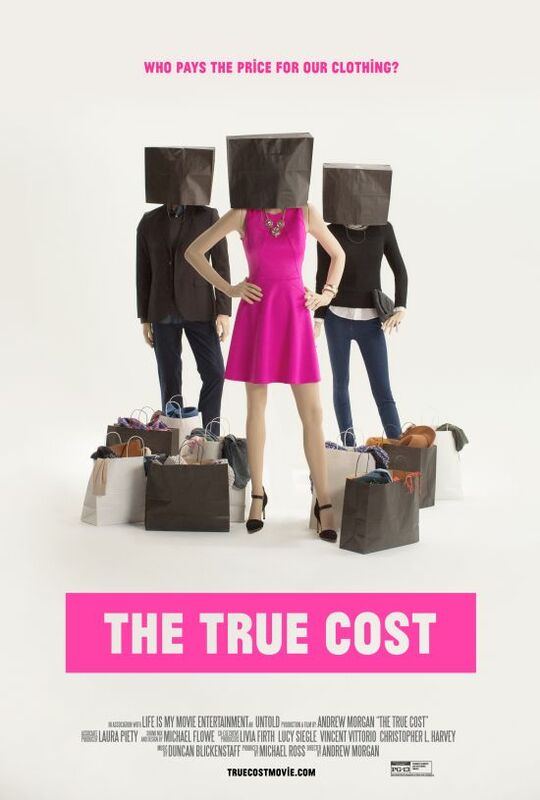 When The True Cost was released earlier this year, the reviews raised some concerns about what the film did not do. While the filmmaker did a good job of showing the various problems – environmental, social, and economic – of fast fashion, there were few solutions to the problems offered. The film also focuses solely on fast fashion, when the reality is that the problems associated with textile and clothing production is not limited to that one sector of the industry. As I watched the film, I was pretty much overwhelmed by the amount of human suffering that is caused by the clothing industry. The filmmaker, Andrew Morgan, follows one woman in Bangladesh, telling the story of how she has to take her small child to live with her parents in their village while she is working in a sewing factory in the city. It is very effective. I was also amazed at the massive piles of textile waste. It really does make you stop and think. But where the film goes astray is in offering solutions. I was almost left with the impression that if we all just stopped being consumers, then the problems would just go away. One of the persons interviewed (who is a 9/11 truther, though that was not brought up in the film) even said that the only solution was to abolish capitalism. He may be right, but how likely is it that either of these things is going to happen? After watching the film I was left with a feeling that I never wanted to go shopping again. But the film was not really aimed at me because I’m not much of a consumer of fashion. I sew most of my clothes using mainly fabrics that I’ve bought secondhand. The message of The True Cost is not hitting its intended audience, the consumers of fast fashion. The people who might really be influenced by the film are unlikely to see it. Several teenage girls were shown in the movie posting their “haul” videos, in which they get on YouTube and brag about all the cheap stuff they just bought. Maybe there should be a second version in which two cute and famous young celebrities narrate and feature in the film. Then it might be more likely to get the audience that it needs. In the meantime, The True Cost is preaching to the choir. I’m a little bit slow to this game, as I had been told that seasons 2 and 3 of The Great British Sewing Bee were now available online to all viewers on youtube. Thanks to an email this afternoon from Del, I had my memory jarred and I’ve now watched the first episode of season 2. Who knew that watching other people sew could be so much fun? Due to a bit of minor hand surgery I’ve got some downtime coming up this week, so instead of posting here, I’ll be catching up on these episodes. I couldn’t be away that long without giving you an alternative to my posts. Enjoy!